Some have said that trading is 90% mental and 10% technical and that successful traders learn to remove emotions (or at least control them) from their trading decisions. The TESTED method is a process to help remove emotions from your trading and allow yourself to be proactive in your trading. An example follows that shows how important it is to use the TESTED method and the process used in the proper order. The first step, and probably most important, is the Target and that is where we will begin. A key decision that needs to be made is where you think a certain stock is headed, or at least where it’s capable of heading. We’ll use a metaphor for trading that involves a trip. Let’s say we wanted to hold a conference in Las Vegas, and so a plan was mapped out and a date was agreed upon. Some of us would fly others would drive, and some might actually walk. The point is that we all know where to go (target), and there are several ways to get there. In the end, we all meet at the same point. Trading is the same way in that we might think AAPL is going to $200 a share and so we can choose to buy stock, options, or even single stock futures. Simply put, we all agree upon the price (target) and that will determine the instrument we choose to trade AAPL. 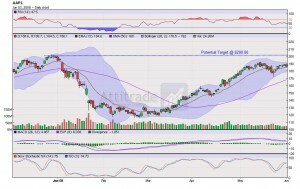 Looking at AAPL, we can see that the stock is at $186 a share and we can compare the target using both stock and options. Our initial investment with the purchase of the $185 calls would be $1,200 and we would have 45 days for AAPL to get to our target of $200. If we purchased the same amount of stock, our initial investments would be $18,600 and we wouldn’t be limited by time as we are with options. Two decisions need to be made at this point and that will divide traders into two camps. One decision would be how much you are willing to risk in the trade with your initial investment. Obviously the option is roughly $1K and the stock is $19K. The second decision is whether or not we want to have time as a factor in our trade. Regardless of our decision, we are still figuring on AAPL making it to $200 a share. To take this example even further, we could make a few assumptions. Let’s say that AAPL did make it to $200 but it took 30 days to do it. If we bought the $185 option and APPL is now at $200, we have $15 intrinsic value in our option. However, our option cost us $1,200 so we are actually up $300 (minus the 15 days of time value, so we could roughly estimate that we would be up $315). If we bought the stock at $186 a share and it is now at $200 we made $1,400. Notice the big difference in the two choices with the same target in mind. Take the return on investment (ROI) and you can see that with the stock we had a 7% return and with the option we had a 26% return. Obviously there is more to this equation, and one is the time it will take to get to the target. The time frame gets you to answer the question of how long it will take for your trade to progress to the point of exit (Target). That exit can come in the form of a triggered stop or, preferably, a triggered limit order. Take into consideration the ATR, Beta, and the average gain over a 6 month period of the stock you are trading to help you determine the time it will take to reach your target. Once you have an idea of the number of days it will take to make it to your target, you should double it in case you are wrong and the stock trends sideways or moves against you for a day or two (if you are trading with the purchase of an option, triple the amount of time). If you look at the chart of AAPL, we can see that for the 6 month period, it is basically where it was in December. This method of using a 6 month average wouldn’t work so we would need to find a trend of at least two months where we can get an average monthly gain. If you look at AAPL back in mid March, the stock was at $120 a share and today it is up around $185 which translates into a $65 move. Divide that by the number of months and you can see that AAPL has the potential to move in great strides in a short period of time. You can also see that AAPL has no problem moving down either and the moves down actually outpace the moves up. Another way to find a timeframe is to use the ATR and cut that in half. AAPL’s ATR is $5.47 for the last month so take $2.75 and you can expect roughly that much of a move every two days or so. This is the roughest of estimates and the method is rather subjective, so always err on the side of caution and reduce the expected moves. The whole point of this exercise is to get you to look at the left-hand side of the chart and really understand what the potentiality of the stock is. Using the information from our example, we can see that AAPL should have no problem reaching our $200 price target within a week’s time so we will focus on the July calls or buy the stock outright. This time frame would fall under the category of a “swing trade” and as such we can expect to be in the trade anywhere form 2-8 days. The other categories would be a “day trade” a “momentum trade” and an “investment” with the timeframes being 2-8 hours, 2-8 weeks, and 2-8 months respectively. Hopefully you have an idea of what kind of time frame matches your lifestyle and as such can choose the appropriate target and timeframe. Now that we have the time frame and target in mind, we need to decide where to get in this trade. Deciding where to get in a trade can mean the difference between success and failure. Oftentimes, the typical “get me in with a break above the prior day’s high/low” is what most traders use as an entry point. This method does not work as many times a prior day’s low/high is breached by traders to trigger orders like that, and then they take it in the opposite direction. The key is to not become a trader who is filled and then stopped out within hours. The TESTED method uses the Average True Range (ATR) of the stock to help us in figuring out a nice entry. The ATR (20) of AAPL is $5.47, so if we wanted to decide on an entry, we would need that number to help us be more exact in our order entry. We use a 20 period ATR because that represents a month in the market and gives us a nice snapshot of the potential movement of our stock. Regardless of whether we are trading straight stock or options, we need that ATR. Let’s say that we want to use 10% of the ATR to get an entry defined, and that would be roughly $0.55. Take that $0.55 and add it to the prior day’s high and that would give you a more accurate entry. In the case of AAPL, the close of the prior day’s candle was $186.10 and if you add the $0.55, your entry would be $186.65. Microsoft (MSFT) has an ATR of $0.67, so if we took 10% of that, we would have $0.07 that we would add to the prior day’s high. It is simple to see that using a percentage of the ATR allows you to compare APPL to APPL and not APPL to MSFT as the case would be if using the traditional “$0.03 above the prior day’s high” tactic for entry. We can, and should, use the percentage of the ATR for stops as well. A stop is the ultimate “double edged sword” and is probably one of the most misunderstood and wrongly used tools in trading. You can use a stop to get you in a trade and to get you out of a trade. Think of a stop as the horn in our car. We “beep” it when we want to get someone’s attention. In this case, that someone is our broker and we need to either get in a trade or out of one. Using our trade example of AAPL, we can look at possible stops for this trade and how we would set those stops up. With options, you oftentimes hear something like “set your stop at a 30% loss in value”. In our example, we would have purchased our option for $12.00 and 30% of that is $3.60 so our stop would be $8.40. This may work fine for the casual trader. However, as a proactive trader, we actually want to use the movement of the stock to get us in and out of a trade. Think about that. Options have volatility and that alone can cause price fluctuation that can dissipate instantly as the trading day progresses. The daily swings in volatility alone could trigger our stop and get us out of a good trade. A proper stop on options should be tied back to the actual stock’s price movement. If you look at AAPL again, you can see that the stock has shown some support at the $177 level and that is what we would use as our initial stop. Its “initial” in that we are going back to our ATR and taking that 10% ($0.55) and subtracting it from the $177 to get our stop of $176.45. Once again, we use AAPL’s potential to get us out of the trade and not just some arbitrary number like “$0.03 below the low”. Interestingly enough, the stop for our option trade using this method would equal a 55% loss on our initial investment of $12. As stated before, if you are not comfortable with that potential loss, then you should be looking for a different stock to trade or a different instrument. In doing so, you allow yourself to remain emotionally detached from the trade and you can proactively prepare yourself before you even submit the order. To truly become a proactive trader, you need to believe that your trade WILL go the direction you thought. This shows that you have belief in your system that finds your trade setups in the first place. If you put your trade on and the first thing you do is mark your stop or think “I hope this goes well”, then you are bound to fail as a trader. Successful traders do not hope. They do the research and use their system to find good candidates and enter the trades. It is at that point that they manage risk. They know exactly how much they have at risk and are perfectly fine if they lose that much. Why? Because it is baked into their system, and every trade does not go the way they thought. You need to be the same way in your trading. You need to have the courage to fail, step off the curb, and enter the trade. Expect that the trade will go your way and use the power of positive thinking. Set your target, entry and your stop and then you know, at any point during the life of the trade, where you stand. If your target gets hit and you see the stock continue to go the same direction, you can’t get mad. You simply put the positive trade aside and evaluate it in a couple weeks to figure out why it continued to go beyond your target. It is at that point that perhaps you make an adjustment to your system. Perhaps you find out that it was a news item that caused the surge and then you know that it was atypical, rather than the norm, and no adjustment is needed. In going through this thought process, you prepare yourself emotionally and as a result remove the chance of trading on emotion once in the trade. As an example, you need to be fully prepared to lose the amount invested in a single trade if your stop is triggered. If you aren’t fully prepared to take that risk, then you need to adjust the size of your trade or move on to another trade. If you prepare and emotionally accept the fact that you could be wrong, your trading becomes more mechanical and less emotional. Take some time to role-play the different scenarios and see what your reactions would be. Oftentimes traders beat themselves up because they left money on the table or set a stop too tight and vow to never do it again. That vow usually leads to trading on emotions and compounded losses that go along with poor trading. Very few traders actually keep a trading journal or any form of report that can be accessed at a later date to perform analysis. Think about that for a minute. We use charts which are made up of historical prices to help predict what is capable in the future; why not do the same for our trading? In keeping a good record, you allow yourself the ability to come back at a later date and assess the trade when all emotions are removed. We suggest a 2 week period from the date the transaction was closed. Going back in and looking at your trades to find out what you did wrong is easy. When was the last time you looked at your trades and figured out what you did right? Take the time to diagnose your trades, find out what you did right, and replicate that time and time again. One of the easiest ways is to get a notebook and a pen or pencil and keep tabs of your trades. A full-time professional trader should spend AT LEAST 30 MINUTES A DAY journaling. An intermediate-term trader should spend at least two hours a week or more journaling. You should review your journal every 30-60 trades or every quarter, whichever comes first. By working every day to document the market’s actions and your own actions, you will improve your understanding of the markets and of yourself. Trading is like a diet; you need discipline in order to be successful. Although this is the last topic I discuss it is probably the cog of the wheel in your journey to proactive trading. Over the years, I’ve seen traders (at least in their mind) come into my office and show me massive losses. Some of the losses could be attributed to not understanding the markets, but a majority of the losses were due to a lack of discipline. Being a disciplined trader means following your system and sticking to it no matter what your feelings or thoughts are. If your stop-loss is at 30% and you hit that mark, then you methodically move onto the next trade and visit this loss in a couple of weeks when the emotions are removed. It is when you pull that stop and start looking at the chart for the next level of support that you get in trouble. Soon, that 30% loss is 50% and you are thinking about doubling down to dollar cost average. Before long you have amassed a 75% loss and doubled down. It is at this point that you begin to tell yourself that you will never do it again, hoping that your position will just get to break-even. There are numerous “systems” out there for trading and thousands of traders trade them. Why is it that some of the traders are successful and some fail? Discipline! Hopefully you have a better understanding of the TESTED method and are prepared to become a proactive trader. The first step is to find a Target and figure out how long it will take to get there. Once you have the Target you can fine-tune your Entry using the ATR. Don’t forget to place your Stop as that will remove the temptation of hanging onto a trade that you shouldn’t. Hanging onto losers is what reactive traders do rather than prepare and accept that stops do get hit and trades do go against you. As a proactive trader you have taken the steps and your Thoughts are clear and you fully understand how the trade works. About two weeks after you’ve closed the trade out you will want to go back and Evaluate it. This allows you to find the things you are doing well as well as the things you are doing that you shouldn’t be. Finally, you must exercise Discipline throughout your career as a trader.